Sometimes you come across a product and wonder why you didn’t think of it yourself. Well, this might be one of those times. If you want a simple Bluetooth speaker that doesn’t take up any space and never needs to be charged, you need to check out the RAYWAY LED Bluetooth Speaker Light Bulb. As the name subtly suggests, it’s an LED light bulb with a Bluetooth speaker built right in. It’s perfect for bathrooms, garages, basements, or anywhere else really, and it’s on sale for $22 on Amazon after you clip the $5 coupon. APP Controlled: Lamp control of LED Smart Bulb from your Smartphone or Tablet with iOS 7.0/above or Android 4.0/above,. Using the top designed App, simply scan QR code on the Manual. Wireless Bluetooth Speaker Music Bulb: After connected, music can sync from your smartphones or tablets with multicolor changing. Please note: Bluetooth transmission distance is ≤ 10 meters. 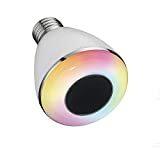 Multi-Color Changing Bulb: Not only 4 color models are available, but also more than 12 more different bright shades to meet your demand in any occasion; the best part of the smart Bluetooth light bulb is it can display the latest color you used last time; lots of fun to brighten your life! Super-Practical Smart Design: The BL08A LED Smart Light Bulb supports Timing Alarm and Sleep Assistant. Under Sleep Assistant function, the music sound will gradually go off as well as the light will be powered off at the end of countdown. Best accompany sleep device! Easy Install – This magic light bulbs are made to the highest standards in the lighting industry. and it is simple to install and use with E27 base. Simple E27 screw in the bulb, And with a lifetime of 20,000 hours and comparable to a 30-60W incandescent bulb, you can save money while looking cool.